Henry, who is a 4 years and 6 months old boy with Down's Syndrome, joined our class in August, 2017. The developmental delay is associated with impairments in motion, language and cognition. “I am excited to have the opportunity to offer Music Therapy with Figurenotes to children in TFCF. Basically,the children play what they see! This is a system that works very well for children with special needs or disabilities. Especially to Henry’s case, it did help overcome language and cultural barriers between us. ** Henry is the fake name due to the privacy and safety of individuals is respected. This year, we’ve learned a music notation system called 'Figurenotes'. It is a simplified system that uses colors and shapes instead of traditional notation. 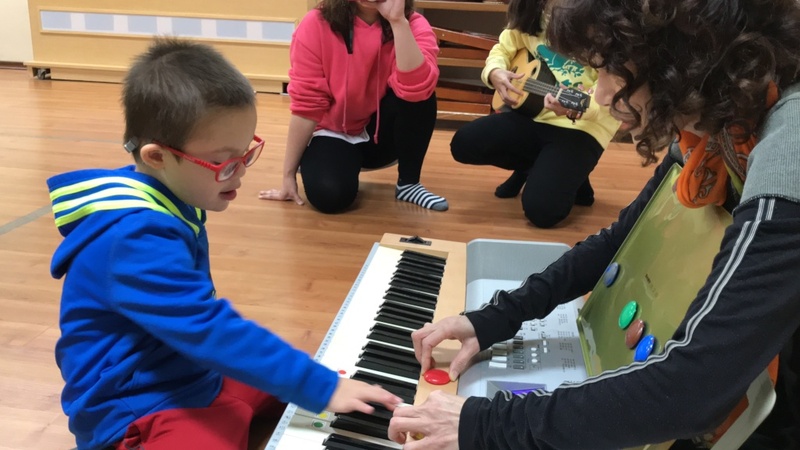 This system can enable children with Down's Syndrome or Autism to develop their musical skills and learn to play an instrument. We provide the music therapy course for children with special needs every month. It has a wonderful healing effect that cannot easily be compared to all the other therapies. All of developmental delay children in TFCF Taichung City Child Development Center benefit from music therapy offered by you. We will continue the program and hope you could support the cause through your participation and feedback. We will carry on this duties professionally and provide the Music Magician to our lovely children yearly with all of your support. Thank you! © 2018 Taiwan Fund for Children and Families. All rights reserved.